Behind the barn. 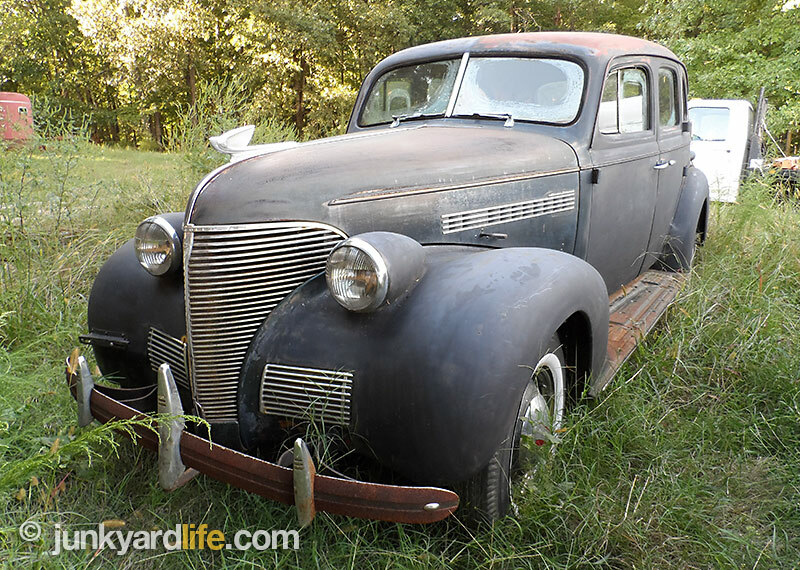 This 1939 Chevrolet Master sedan was among the dozens of classic cars and hot rods that Junkyard Life discovered during a three-day tour of Tennessee, Georgia, and Alabama. 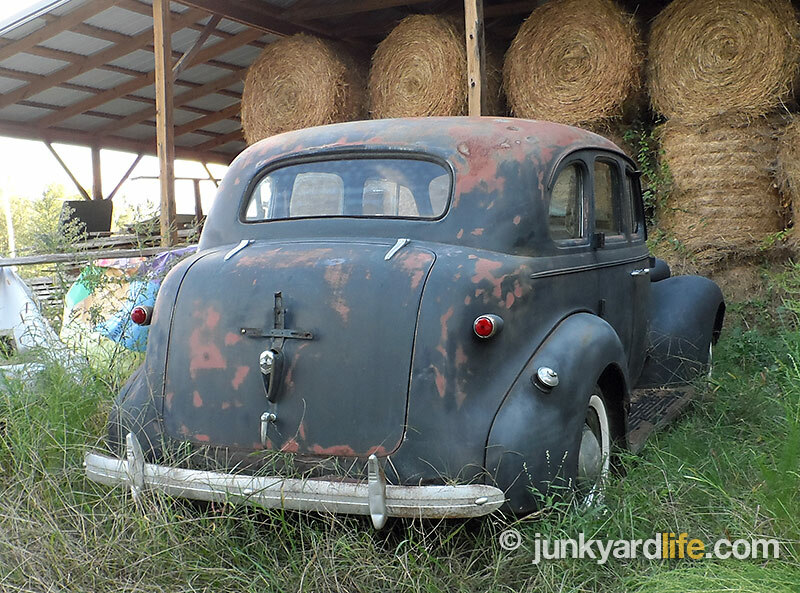 The owner, a gear head with 20 rusty cars scattered across his East Tennessee farm, mentioned that an old Chevy behind the hay barn was a low-mile, solid, original. 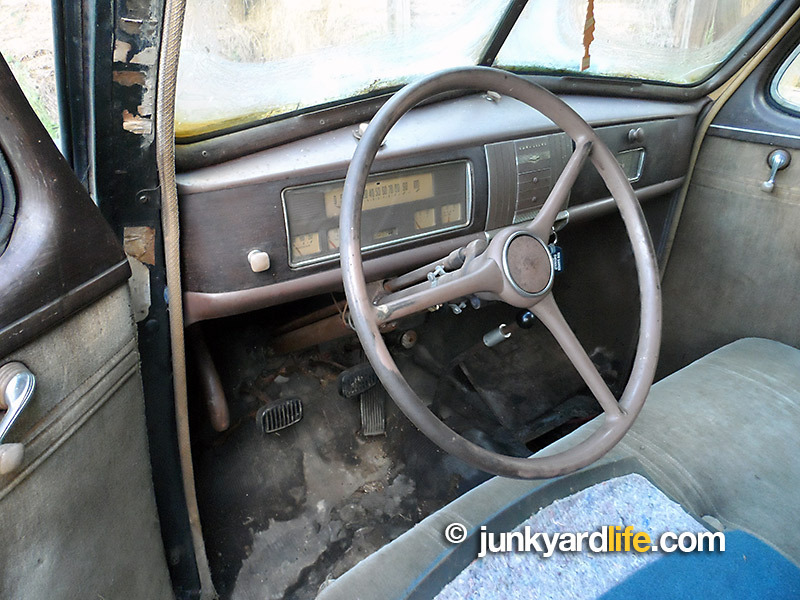 We didn’t expect a WWII-era car in time capsule condition. Let’s take a closer look. Chevrolet redesigned their 1939 models with longer hoods, the headlights mounted on top of the front fenders and coil spring suspension. The flashier grille and hood ornament mimicked Cadillac’s luxury line-up. This was a lot of car for less than $900. The price sounds like a steal, but remember the average annual income was $1,300. Only 590 miles show on the odmoeter of the 1939 Chevy. The wear on the brake pedal reveals that the actual mileage may be more. A trunk was integrated into the body lines and the rumble seat option disappeared from the line-up of 1939 Chevrolets sedans. 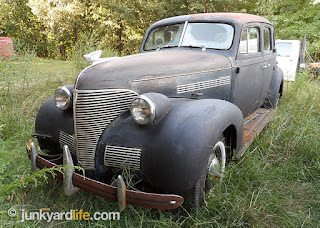 The Junkyard Life crew crawled all over the ’39 Chevy, noting the 590 miles on the odometer and the relatively unblemished body. The car has probably traveled many more miles on the original inline six cylinder engine and 3-speed transmission, but we can dream, right? Everything appeared unmolested and was where it should be on this blast from the past. Values on mostly original, 4-door, 5-passenger, club sedan projects of ’39 vintage have stayed surprisingly low. I’ve seen similar cars, in somewhat rougher condition sell in the $2,000 price range. Hot rodders had a field day transforming forgotten, family sedans from the 1930s and 1940s into custom street rods during the 1980s. Those pastel-painted beauties and quality rest mods often sell for $20,000-to-$30,000 and up. 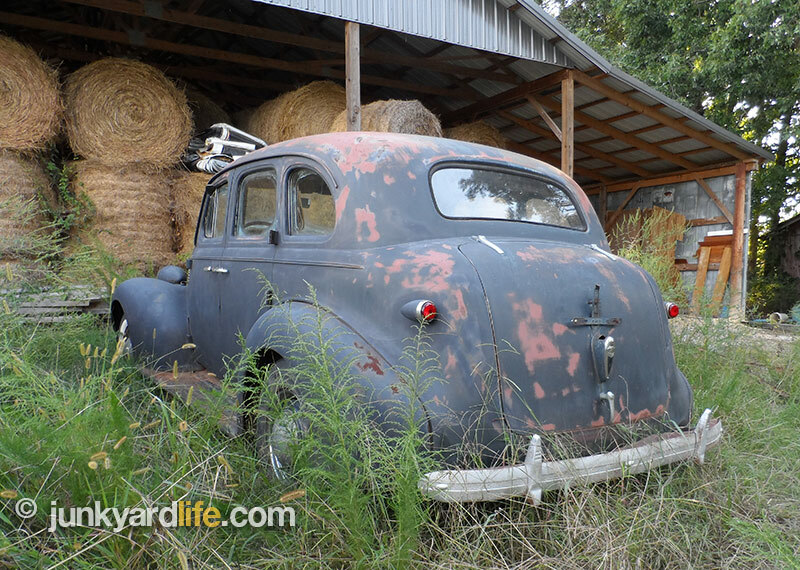 Finding an original car is the best way to budget build your own. What’s stopping you? Time or money? Coupes can bring more dollars but the 4-door sedan was the do-everything family car. Imagine pulling into the big box store next to a row of new Chevy Suburbans, Tahoes and mini vans? A 1939 Chevy puts the "class" in classic car. 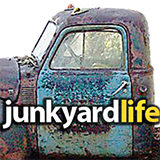 Keep your eyes open for old cars and I will see you at the junkyard! It's easy to see why we stopped to have a chat with the friendly farmer in Tennessee. He loves old cars too.